This is the first time I have ever made tomato soup and it will not be the last. I am a humble man but this soup is out of this world. Do yourself a favor, make it and make some croutons to add to it. I love it when it comes together. 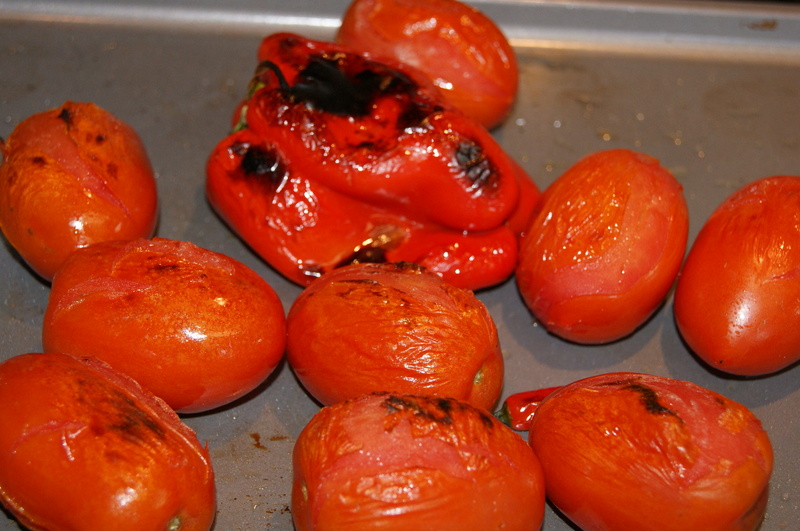 Coat the tomatoes, red peppers, and Serrano pepper with oil and place on a baking sheet. Put under the broiler, stirring often and broil until the skins start to turn black. Remove them from the broiler and let cool. Remove as much of the skin from the tomatoes, red pepper and Serrano as you can. Roughly chop the mix and put aside. In a stock pot over medium heat place 1 tbsp. of the coconut oil in the pan and add the tomatoes and any juice, red pepper, and Serrano. Season the tomato soup with salt, pepper, 1tsp cumin, and 1 tsp. paprika. Cook until the tomatoes begin to break down. Add 1 can of tomato sauce and simmer for 20 minutes. 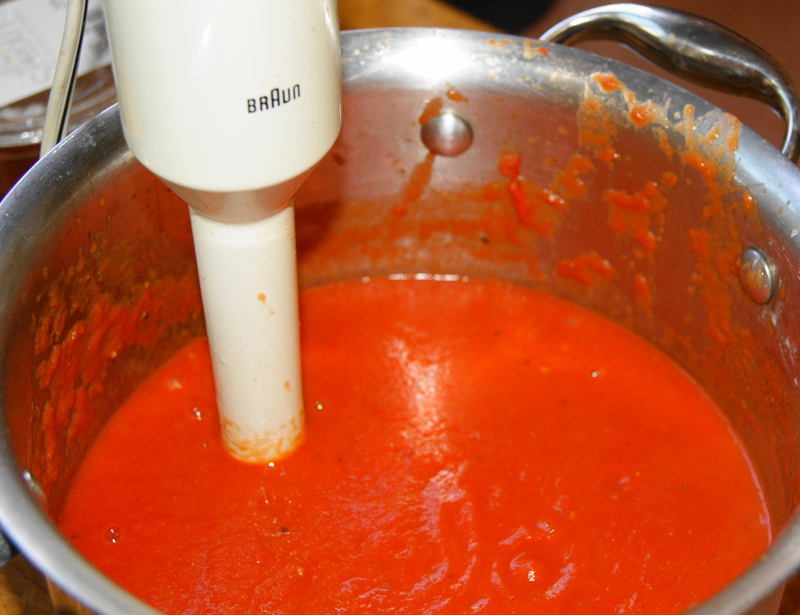 Using an immersion blender blend until the tomato soup is smooth. Check for seasoning, (if the soup needs some sweetness add a handful of raspberries and blend till smooth. Let the soup simmer for 5 minutes while you cook the vegetables. Add as much coconut milk to make a smooth soup (your preference on how much). I used all of the coconut milk. Heat 1 tbsp. of the coconut oil in a skillet over medium heat. Add 1 tsp. of cumin and paprika and heat, stirring constantly for about one minute. You should be able to smell the spice. Add the red onion and cook until the onion is becoming soft. Add the zucchini and yellow squash. Cook until the vegetables are al dente. Check for seasoning and add salt and pepper if needed. Remove from the heat. 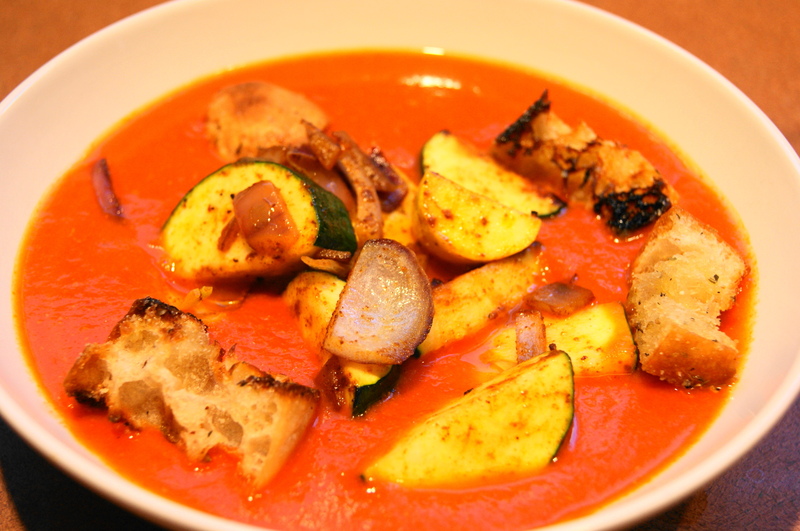 To serve, place a large ladle of soup in a bowl, top with the chopped herbs and the vegetables. You could add croutons if you choose.